The name says it all. This group of huge carnivores must have tyrannically ruled the land during the last part of the Cretaceous, 85 to 65 million years ago. Short but deep jaws with banana-sized sharp teeth, long hind limbs, small beady eyes, and tiny forelimbs (arms) typify a tyrannosaur. The Tyrannosauridae included such similar animals (in rough order of increasing size) as Albertosaurus, Gorgosaurus, Daspletosaurus, Tarbosaurus, and of course Tyrannosaurus rex. Tyrannosaurus rex is the world's most famous dinosaur and almost everyone is familiar with it. Comparatively few have any knowledge of his relatives - the other members of the Tyrannosaur family. 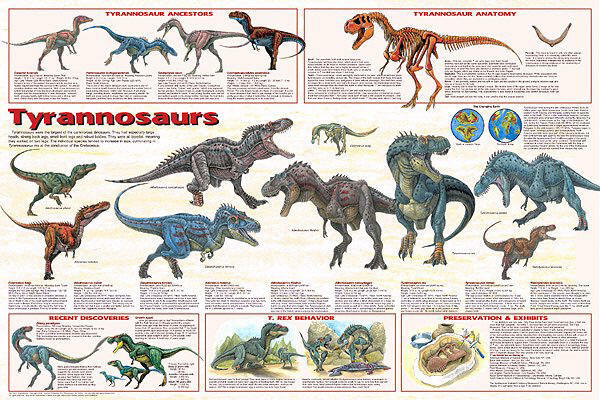 This introduces T. rex and nine of his cousins, all listed at left. An informative caption cites name, pronunciation, size, when he lived, where fossils have been found and interesting information. Informative insets explore tyrannosaur ancestors, anatomy, behavior, recent discoveries and museums where T. rex fossils may be seen. Dr. Phillip Currie of the Royal Tyrell Museum in Alberta, Canada was the technical consultant on this poster. He is regards as one of the world's leading authorities on tyrannosaurs. Tyrant dinosaur paleobiology has been the subject of numerous technical and popular studies and speculations, due to the fact that they are known from relatively complete fossils of large to gigantic size and highly derived anatomy. Some authors (Lambe 1917, Colinvaux 1978, Halstead and Halsted 1981, Barsbold 1983, Horner and Lessem 1993, Horner 1994, Horner and Dobb 1997) have suggested that tyrannosaurids in general or Tyrannosaurus rex in particular were obligate scavengers, incapable of taking down live prey. However, Farlow (1993) and Holtz (in press c) have found these theoretical, ecological and ecomorphological arguments wanting at present. Instead, as is the case with most large-bodied terrestrial carnivores, tyrant dinosaurs probably used both scavenging and predation in order to obtain their food. Carpenter (2000) has documented an adult specimen of the hadrosaurid Edmontosaurus annectens with a bite mark attributable by morphology and stratigraphy to Tyrannosaurus rex: because this injury shows subsequent regrowth of bone, this wound was inflicted on a living animal rather than a carcass.